The Committee in New York sends a team of aces to investigate. One by one, each falls victim to evil forces - including the dark impulses within themselves. Only the perseverance of the most unlikely of heroes has a chance of saving the world before utter chaos erupts on Earth. 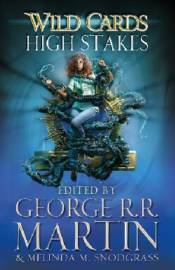 Edited by #1 New York Times bestselling author George R. R. Martin, High Stakes features the writing talents of Melinda M. Snodgrass, John Jos. Miller, David Anthony Durham, Caroline Spector, Stephen Leigh and Ian Tregillis.